Contacts. Who to contact for more information. Data and Maps. Find sampling locations and review data. Materials. Reports, publications, SOPs and other quality assurance materials, etc. Sampling and analysis. Overview, field methods, data analysis methods, and descriptions of algae and macroinvertebrates. Why biological monitoring? Importance of biological monitoring and assessments. 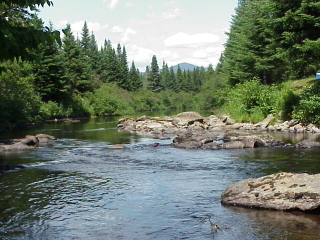 The Maine DEP's Biological Monitoring Program assesses the health of rivers, streams, and wetlands by evaluating the composition of resident aquatic benthic macroinvertebrate and algal communities. The Biological Monitoring Program can tell how healthy the waterbody is based on the amount and types of aquatic macroinvertebrates and algae living in a waterbody. The amount and types of macroinvertebrates and algae living there change when waterbodies are polluted or disturbed. For example, a polluted stream will often lack pollution-sensitive organisms like mayflies and stoneflies and will have more pollution-tolerant organisms like snails and leaches.  Determining if waterbodies are attaining environmental goals (criteria) associated with Class AA, A, B, and C waterbodies as part of Maine's Water Classification Program .  Documenting a waterbody's existing condition and tracking changes over time.  Identifying and prioritizing waterbodies that do not attain their assigned environmental goals and are in need of restoration or remedial action.  Improving permit and licensing decisions with greater understanding of environmental impacts.  Evaluating and documenting the success of restoration, conservation methods, and permit and license decisions at protecting and restoring aquatic life. Under the federal Clean Water Act, States are required to develop programs to evaluate the physical, chemical, and biological integrity of the Nation's waters and to adopt water quality standards to restore and maintain that integrity. States must also report to Congress on the condition of all waters within their boundaries every two years. The information collected by Biological Monitoring Program satisfies these requirements for assessing the biological integrity of Maine's freshwaters.